For other uses, see Vaseline (disambiguation). Vaseline /ˈvæsəˌliːn/[note 1] is an American brand of petroleum jelly-based products owned by British-Dutch company Unilever. Products include plain petroleum jelly and a selection of skin creams, soaps, lotions, cleansers, and deodorants. In many languages, the word "Vaseline" is used as generic for petroleum jelly; in Portuguese and some Spanish-speaking countries, the Unilever products are called Vasenol. The first known reference to the name Vaseline was by the inventor of a process for making petroleum jelly, Robert Chesebrough in his U.S. patent (U.S. Patent 127,568) in 1872. "I, Robert Chesebrough, have invented a new and useful product from petroleum which I have named Vaseline..."
The name "vaseline" is said by the manufacturer to be derived from German Wasser "water" + Greek έλαιον (elaion) "olive oil". In 1859, Chesebrough went to the oil fields in Titusville, Pennsylvania, and learned of a residue called "rod wax" that had to be periodically removed from oil rig pumps. The oil workers had been using the substance to heal cuts and burns. Chesebrough took samples of the rod wax back to Brooklyn, extracted the usable petroleum jelly, and began manufacturing the medicinal product he called Vaseline. Vaseline was made by the Chesebrough Manufacturing Company until the company was purchased by Unilever in 1987. 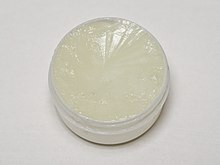 While Vaseline can be used as a lubricant, it can also be used as a moisture insulator for local skin conditions characterized by tissue dehydration. Vaseline has been reported to be highly-refined, triple-purified and regarded as non-carcinogenic. ^ Also pronounced with the main stress on the last syllable /ˌvæsəˈliːn/. ^ "Definition of Vaseline". The Free Dictionary. Retrieved 7 November 2013. ^ "Define Vaseline". Dictionary.com. Retrieved 7 November 2013. ^ Adams, Rebecca (21 October 2013). "Petroleum Jelly May Not Be As Harmless As You Think". Huffington Post. Retrieved 26 March 2018.